Salted. Caramel. Cheesecake. Need I say more? To many, plain cheesecake is decadent enough. 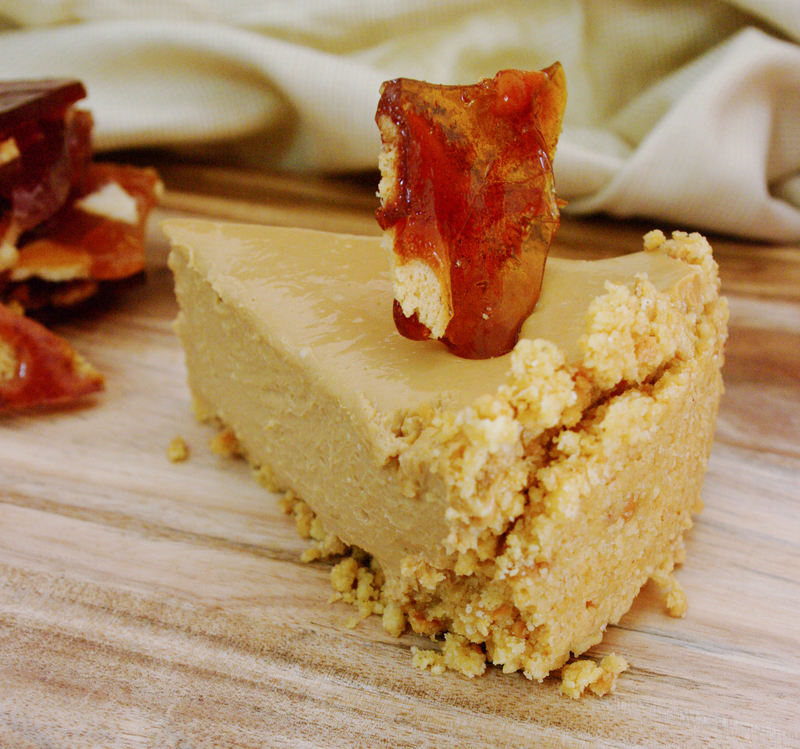 For me, this amazingly delicious Salted Caramel Cheesecake, is gluttonous heaven. 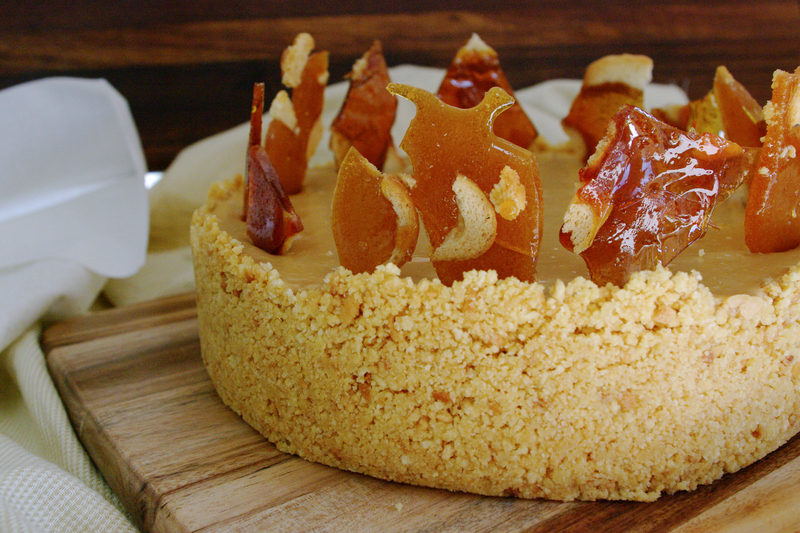 A buttery, crunchy, salted bagel crisp crust that sits beneath a smooth and creamy caramel cheesecake filling, topped with praline shards that hold notes of caramel, salt and bagel crisp crunch. Wow. Place 2 packets of Abe’s Bagels – Marlborough Sea Salt Bagel Crisps into the bowl of a food processor and process until it resembles a fine crumb. Add the melted butter and process until combined. Press the crumbs evenly over the base and sides of a lined, 20cm springform pan using the back of a metal spoon and chill in the refrigerator for 20 minutes. Place cream cheese and caramelised condensed milk into a large mixing bowl and using an electric mixer, beat until smooth. Place boiling water in a heatproof bowl and sprinkle with the gelatin. Stir until gelatin dissolves. Add gelatin mix and salt to the cream cheese mixture and process until well combined. Pour the cream cheese filling mixture over the bagel crumb base and refrigerate overnight, or for a minimum of four hours. Line a baking tray with baking paper. Combine sugar and water in a saucepan over low heat. Cook, stirring, for 5 minutes or until sugar has dissolved. Increase heat to high. Bring to the boil, and boil, without stirring, for 5 to 7 minutes or until the mixture turns golden. Remove from heat. Set aside for 2 minutes to allow bubbles to subside. Roughly break ½ a packet of Abe’s Bagels – Marlborough Sea Salt Bagel Crisps into halves and quarters and arrange on prepared tray, pour over sugar and allow to cool before breaking into praline shards. Carefully remove cheesecake from spring form pan, arrange praline shards on top and serve. Isn’t it delicious Cleo! I just love it too… and how can you go wrong with a cake made of cheese! ?